I've noticed over the past couple of years that I've developed an especially bad habit–I'm having a harder and harder time finishing novels that I pick up. I wasn't always so hard to please! There once was a time when I finished almost every book I started. But these days, my shelves (both real and virtual) are overflowing. My audio book club points are waiting for me. And I also have books regularly coming in for influencer or endorsement purposes. I have plenty to read. But not enough time. And to be perfectly honest, the longer I write, the harder it gets to find books that I like. My internal editor often comes out in the middle of books and gets impatient or too picky. 1. Not enough conflict and tension. This is absolutely the number one reason why I put down a book. If the story doesn't introduce me to the central problem and the ensuing issues right away, I'm likely to get bored. Even if the conflict is introduced right away but is weak, contrived, or non-cohesive (ebbs and flows with nonessentials), I still might yawn. Every time I set a book down, I need a compelling plot line that makes me want to return. 2. The characters don't make me care. This is the second main reason why I put books down. If the characters are abrasive, boring, unheroic, or simply haven't done anything to make me like them, then I usually have a hard time staying tuned to the story. 3. Too slow moving. Even with good conflict and tension, and even with characters that I've grown to care about, if the story begins to slow down or the author slips in paragraphs/scenes that don't move the plot along, I often lose interest. This includes backstory dumping or internal narration with very little else going on. 4. Overwriting. If the writer describes too much, has verbose dialogue, has large paragraphs, is redundant, overuses adverbs or dialogue tags, or is just plain wordy, I usually start skimming. I like to get to the heart of the story and only need to know those things that truly add flavor and character. 5. Lack of depth. If a major part of the story happens at a very surface level or if the writer doesn't take me deeper into the passions and emotions of the characters, then it's harder for me to engage with the story. This is often connected with the development of the character and the lack of past pains and motivations that usually drive the emotional current of the story. 6. Subject matter doesn't appeal. Yes, sometimes, for whatever reason, the subject matter of the book or the themes don't hit me deeply enough. Or perhaps the character growth/issues seem superficial. Or the whole plot of the book centers around something that just doesn't hold my attention. As much as we want to give weight to all topics, subjects, and settings, there is some truth about universal commercial appeal and finding themes most people can relate to on some level. 7. Amateur writing. This could take on the form of a number of things including not writing by scenes, too much telling and not enough showing, underwriting (not giving me a sense of setting or character), over-dramatizing (so that the story isn't believable), or even making beginner mistakes (using clichés, stilted dialogue, too many characters, etc.). So those are my top reasons for putting a book down and not picking it back up! 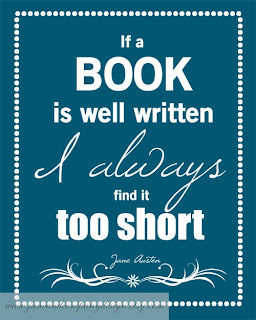 On the other hand, I have to agree with Jane Austin, "If a book is well written, I always find it too short." Now YOUR turn! What are the main reasons YOU put a book down? What kinds of issues make you give up on a story? Or do you always try to finish every book you start? I always try to finish. The very few I've put down were poorly researched--not true to historical or biblical facts used as part of the story--or else they were just that dull. Only two come to mind. I usually hang in there, hoping for improvement. I usually hang in there. I feel once I've started a book I've invested time and I need to finish what I started. But now I am getting pickier. I simply don't have the time for a book that doesn't capture me, make me think, challenge me. I realize the time I'm putting into reading a dull book I could be using for writing. This is a timely post. I went through a horrible stretch at the end of March/beginning of April where I could not finish a book. Even more troubling, I'd read up to 100 pages in a couple of them, and all the way to page 189 in another and I STILL didn't care. It's one thing to recognize in the first few chapters that you're bored, but quite another to be more than halfway done and give it up. I felt like there was something wrong with me, like I'd become passionless and unforgiving, or struck with a case of reading ADD or something. But I just reviewed your 7 points with my DNF books in mind, and I realize I'd stopped b/c of many of the same reasons you listed. I just hadn't given it enough thought to articulate why. So thanks for putting this excellent list together. :) I'm going to save it in my books-read document and review it when I don't finish a book (and yes, I keep a list of what I read *and* what I do not finish). I'm sure studying why I love a book and why I didn't finish a book will strengthen my understanding of storytelling and help me as a writer. It was only this year that I decided that if I didn't like a book I was going to put it down. For a while, I thought it was sort of a "professional courtesy" to read an entire book -- if an author, like me, took time to write it, I should take the time to read it. But I found that I never wanted to pick the book up if I didn't like it. So it would take me months to "get through" books. I realized that was silly. So now I give it about 50 pages before I throw in the towel. As a friend of mine said recently, "There are just too many good books out there to waste time on the bad ones." Jody, In the very first class I took at a writer's conference, Alton Gansky told us, "Once you start writing, you'll never read the same way again." And he was right. Like you, my internal editor takes over. I'm pretty particular about the books I even start reading, which is why I re-read a lot of books I enjoyed ten years ago and like re-visiting because the writing still grabs me. There was a time when I figured "I've got this much invested in it, I'll finish the book." No more. If I give up early on, I let it go. If I slog through enough to be curious, I read the last two chapters, which usually give me all the information I want. Richard, I just want to echo your thoughts on re-reading beloved books. I used to think doing so was wasting time when there are so many new books out there. But after returning a second (third, fourth) time to my favorites, I decided reading only new books was silly. Cherished books bring a certain magic, and I consider it one of life's sweet pleasures to nestle into that magic over and over again. I have so many books I want to read-- more than I will ever have the time to read-- that I, too, have become more picky about what I finish. If a book doesn't engage me within the first chapter or two, I will put it down. I read a lot of nonfiction/memoir type books, and if a book is overly self-indulgent, I will put it down. If a novel is too trendy-- no quotation marks or separation of paragraphs for quotes or other trendy tactic, I will put it down. I don't want to work that hard. But oh joy for a book that engages me with beautiful writing! I'll put books down for pretty much the same reasons, here. I've put down about five in just the last two weeks, ugh! I might give a book until page 50, or even less if it just bores me. There are too many other books on my to read list! I used to pride myself on reading everything too. Then I learned to write....I still think I give people more time than most, 10 chapters, but maybe because I read fast I think I'm not giving them enough time before then. Of course, the book I just decided to quit was at the 4 chapter mark, maybe I'm getting pickier. I agree with all reasons you listed. Recently I discovered another reason for me to quit reading: when there isn't anything fresh or new in it. Just yesterday I was reading a romance where the hero's ex-girlfriend shows up, claiming to be pregnant (obviously not a Christian novel, but anyway) and that storyline is so cliché that it made me quit reading right away. If a writer can't be bothered to come up with something original, I don't make the effort of finishing a book anymore. Like many said before me: there are too many great books to be read to waste time with bad or mediocre ones. Until I began writing I don't think I ever stopped reading a book. I made careful choices and felt obligated to finish what I'd started. Being a quitter in anything would make me feel guilty. But the more I write the more picky I've become of what I read. It's also a time thing. I never seem to be able to whittle down my TBR pile, so I'm getting less hesitant about discarding books that I'm not enjoying. The one thing that still bothers me though, is not finishing a book that others have pronounced good. I know it's a personal taste thing, but I think I *ought* to appreciate the quality of an award-winner or reviewer's choice but it can sometimes be such a struggle. Another thing that makes me put down a romance is when the hero and heroine are not together enough. I don't like when it takes tooooo long to get them together in the first place, or if they're wandering off doing things separately for too long. I'm always thinking "Get back together!" I had to discard two books that did this, recently. Something to remember as I write my own romance. Great point! We definitely have genre expectations! And if the genre doesn't deliver (like the romance developing well in a romance novel or suspense in a suspense), then I'm more likely to put down the book too! Overwriting can be very annoying. There's a book I got this year that I didn't complete for that very reason. All your points are good reasons to stop reading a book. I get annoyed with overly snarky narrators. That alone automatically pairs down a LOT of YA novels for me right there. It's also why I couldn't get into "Olive Kittredge" by Elizabeth Strout, and this was BEFORE it won the Pulitzer, which didn't ease the guilt I had for not connecting with it. But I personally didn't have problems with the WRITING, or even the story, I'm just not as perceptive to snarky narrators than most readers under 30 today. But I LOVED "The Thirteenth Tale" by Diane Setterfield, that has a lot of black humor and subversive semidarkness, yet I enjoyed that book. This was because it was more than snark, and it was in part because the writing was so engaging, but I did care about the characters, even the ones I wanted to see arrested or chided for devaluing someone unjustly. I'm just trying to say it's OKAY to not love a book without taking issue with the writing itself. We writers often talk about how not all well written books are well-crafted stories. "Slower paced stories are NOT always code for 'Amateur Writing.' Period." Some books take WORK to read, but that doesn't mean they're badly written or not engaging to read. 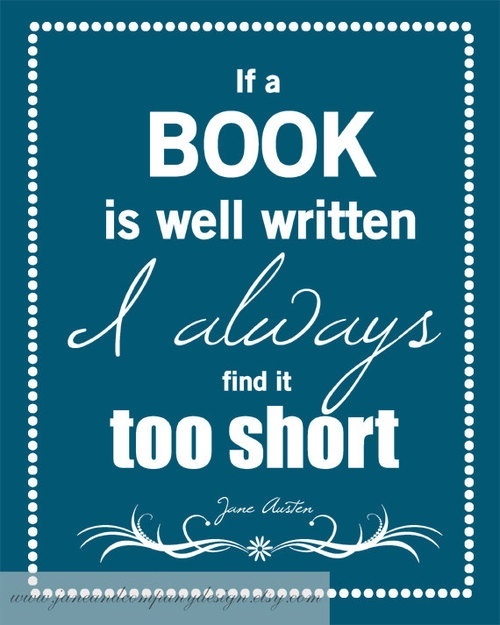 Not to say anything bad about fans of Jane Austen, but I couldn't read it at 11, 14, or even now at 26, and I didn't have severe learning issues, either. In that same vein, a lot of my favorite books I find some of my writer friends find moves "too slow" for them personally as adults. Never mind how it might be negatively perceived by young readers today. Since I primarily write children's books, the issue of pacing and overall readability on the technical level takes a HIGHER level of necessity than novels for YA or adults. It also gets my hackles up a bit when people make overly broad statements about adult fiction. Not all of us have the attention span of a two year old, and I hope you parents/writers know what I mean. One of my favorite books is "Why Be Happy When You Could Be Normal?" by Jeanette Winterson. While arguably many teens would relate to dealing with difficult family members, not everyone would stay with it, and in fact, I had trouble sticking with it, but that wasn't because the writing wasn't "Up to standard." While my family's not as dysfunctional, and thankfully didn't force-feed me religion to the extremes as the mother of this author, or I'd have snapped and ran away myself, thankfully that didn't happen to me, I can realte to the author's non-relationship with her adoptive mother as it mirrors emotionally my own, but thankfully no one tried to take my coping mechanisms away. Could the average young reader read that book? No. Does that make it a bad reading for an older (However you define that) reader? No way! Regardless of exceptions to the rule, not everyone at 13 moves right to adult novels, and not everyone who loves a certain type of book that's primarily aimed at young readers, are children under 13. Sometimes as writers we focused so much on the business of it, we just lose touch with that difference. AS much as we don't like to admit it, there frankly is a difference in how writers read than lay readers who don't write with intent to publish, and so there's sadly that discrepancy, and those who deny it are either geniuses or cruelly narrow-minded. That can't help but add to an already onerous process of writing a book. An aside, I wasn't adopted, I was talking about my birth mother, but my grandmother raised me. Taurean, I think there's a HUGE difference between the way a writer reads and the way a lay reader reads. In fact, the more we writers learn about the techniques of writing, the bigger that gap grows. Most lay readers don't necessarily analyze books as they're reading the way we writers do. And if lay readers don't enjoy a book, they may not always understand why or what was wrong with the book--just that it didn't resonate. This post makes feel so much better. I always feel a twinge of guilt when I quit on a book. (I think this goes back to my background as an English major/HS Eng. teacher.) Lately, I have so little patience for books that don't grab me and keep me interested. Never mind the books that I'm editing in my head as I read. What I've been telling myself is that reading shouldn't feel like work. There are so many good books and there's no reason for me to waste too much time trying to get into a book that isn't connecting (for whatever reason) with me. I was really interested in reading this entry on why you stop reading novels. After I read your "Lack of depth" comment, I got the idea that you'd hate the novel I'm working on right now. I don't really do a ton of character development in the novel, really. Instead, I do a lot of scene development. I'm building a world for mine - technically, it's on Earth, so I'm building an overlay for our existing planet, a bit easier than building a world, though also more constraining because I can't just make things up since while the novel I'm working on is science fiction, I'm trying to make the actual location-based details accurate. But then, I know this novel won't appeal to everyone. It doesn't bother me, I do think there are plenty of people who would like it. I do try to develop actual personalities for the characters in my novel though, so I do make an effort to make them more than just cookie cutter characters dropped in just to have something in the scene. I'm reading a book at the moment that is a real struggle, but I'm sticking with it for research purposes: it's a bestselling author. A lot of the dialogue is terrible, very clichéd and there's a lot of 'as you know, Bob' moments. I find myself rolling my eyes through a lot of the narrative as well. Not only is a lot of the story unrealistic for the time period, there are too many coincidences. It's also too slow-moving in general, while the romantic relationship is frustrating (it happened very quickly at the start, but from the half way point nothing has really changed). It's a good thing the hero is half-interesting or I would have completely given up. It just always frustrates me when I see so many of the supposed "errors" we aspiring authors are warned against. I agree with all of your reasons. Personally, I would add: poor editing job. I can't believe the errors I find in many books - wrong word, mostly. I especially like the point about the importance of unlikable characters. It's much harder to read a book and become invested in the main character's life if I don't like him/her at all. I also agree with the part about overwriting. I read a book recently where the narrator apparently felt the need to provide a back story for everything, including why she believed in certain things. I kept skipping ahead past the descriptions to see if any action was actually going to occur, and I had to skip through many pages. I don't think that the narrator or other characters should keep explaining everything to the reader; it should become evident as the story progresses. I read science-fiction, so I'm not sure how much my answer will be useful to you (though there are parallels to fantasy and historical fiction). The number one reason I put a book down is when the author focuses too much on the setting, and far too little on the cahracters and plot. I don't just mean lenghty or purple descriptions, but even with great descriptions and interesting (exotic, alien) settings that would be amazing to see in real life, if the story is not moved along by the characters making decisions, but by the characters changing location, then I'm done. Not even the greatest setting can sustain a book all by itself, and in the case of science-fiction, there are many (even officially successfull) novels which are nothing more than short stories immensely bloated with a fantastic setting. I've found the same thing, Jody. Even with authors I've loved, I sometimes spot things that I can't help but hope my editor never lets me get away with. Number 2 on your lost is the primary reason I give up on a book. I can let almost anything else pass, but the moment I stop caring about the protagonist, whether they've taken an action I find unforgiveable or they've just had so much angst dropped on them that it's like the author is just making things as harsh as possible for the sake of it, I find it really hard to keep going. There are truly wonderful authors out there who I've found this with. The tribe of discerning readers seems to be growing by leaps and bounds. I had not thought about why so many unfinished books sit on my shelf. You nailed it. And Grace's comment about poor editing also belongs on the list. Yes, writing has changed my reading, and publishing 70+ reviews has changed both. Book reviewing is one of the best ways to hone your craft. Most print books I read come from the library, so I don't feel guilty. Libraries rely on circulation as well as foot traffic and any other form of patron involvement to justify continued funding. Check out lots of books, guilt-free! I recently picked up a book I saw reviewed as deeply romantic by Entertainment Weekly (it's mainstream fiction in hardcover). It started slow, and by the time I had a sense of the main characters, I knew in my gut the story was going to disappoint me in the end. I skipped to the end, and lo and behold, I was right. I also tried another recent mainstream literary book that's been getting rave reviews. It was described as fast-paced. It was not fast paced. I hated one of the main characters, and I really didn't care about the other one. I kept reading, since the reviews promised a "thrill." The writing itself was fantastic--great word choices--but it was too slow and the characters too unlikable for me to really enjoy it. I will say the plot was unique, well thought out. Anyways, this post is rather timely Jody because lately I started this series that I've heard many, many readers simply fell hard for. I read the 1st - was a bit disappointed but thought it wasn't too bad. Around last week and this week, I gave the 2nd a try and I'm leaning toward giving up - if not to say that I already gave up. I kept wondering why I felt something was amiss and I realized that I did not care much for the characters and I found some of them and their love stories quite shallow. I try not to give up on books though. If let's just say I read 90 in a year, out of those 90, I'll probably give up on 4 or less and most of the times I have good reasons for doing so. Hi Ganise! Great questions! I think the answer of why writers read a lot will vary from writer to writer. I would venture to say that most writers LOVE stories (and telling them) and that's part of the reason they become writers in the first place. I grew up reading and listening to stories so that it now feels like a part of who I am. I honestly don't know how a person could be a writer if they didn't also enjoy and read prolifically. A second reason I read more widely and more critically is because I want to grow in my own writing skills. And when I read, I'm soaking in the cadence of story-telling along with the techniques others use. I study what's wrong and right and how I can apply that to my own writing. A third reason I read, is so that I can grow as a person. I feel reading benefits my brain more so than watching TV or movies. I always want to keep challenging myself to grow and learn no matter my age! Richard is spot on when he says that becoming a writer changes the way we read. One of my first fiction teachers said writing "ruins" reading for authors and in a way it's true. We become less forgiving of the flaws inherent in most novels to one extent or another and find them harder to finish. And we scratch our heads when we are taught basic "rules" such as "show, don't tell" and then we read books by the most successful authors in the business in which most of the story is told and not shown. It's a fascinating subject. I enjoyed this post very much. As a book reviewer, I end up finishing most books whether I want to or not, unless there's foul language, too much sensuality, etc. It just reflects in the review I give it. It makes it very interesting as several books I've given low "stars" to have been on multiple top christian fiction lists, but I couldn't enjoy them due to unlikeable characters, unreal situations/reactions and poor research. Other than language/sensuality, those are the top 3 reasons for me to dislike a book--even if I finish reading it to fulfill the review request. Great post! I have the same reasons as you. My top reasons are the same as yours, though I also have one other. I was recently reading a book that I was having a really hard time getting into and I couldn't work out why. It was a genre that I really enjoy and it had had rave reviews. I finally worked that it was because the cast of secondary characters was too big and confusing and some of them were unnecessary and/or difficult to differentiate between (ie. you could have easily combined two into one). I was in a really busy patch and often only had time to read a chapter at a time and sometimes it would be a few days between reads. Every time I picked up the book I had to re-read at least the previous few pages, sometimes more, in an attempt to remind myself who each secondary character was. I persevered but I was still mixing up some by the end of the boom which definitely detracted from the experience. Wow, you're picky! I give up on books that have characters I don't care about, too much description or that the topic just doesn't get my interest. I will definitely try to read some of your books. Just discovered you through Twitter! I wonder if people like to read novels where the main character is at a similar age and someone they can identify with? I've found, in romance novels, that rarely is the main character past her thirties. I wonder if this is a factor in novel abandonment for older readers. I think my biggest age group of readers is women between 50-75. I get handwritten letters from many women who don't have internet telling me how much they enjoy my books. And the characters in all of my books are young (early 20's). I think if the character is well-written, it usually doesn't matter what the age is. For example, I read children's books all the time with my kids and love so many of the books regardless of the ages of the characters. A good list! I still rarely put down a book, but usually if I do, it's because of one of these flaws. Too stupid to live characters. Killing animals in a thriller. Often this is just used as a way to show "Bad guy is evil," which turns it pretty gratuitous. Excessive profanity. Usually this signals a taste level I'm not going to enjoy. A subplot that takes over the story, or inappropriate subplot for the story. Your list is excellent, but I'll add a couple more reasons to throw a book against a wall. And yes, I've done that. I love historical romances, but I have a real problem with dialogue and wording which doesn't fit the time period. I also love to find words that I have to research myself. Love this list and agree with many of the comments, especially Allison regarding historical fiction. If the history is poorly researched or the characters are 21st century personalities dressed in period costume, I give up quickly. I do sometimes finish a book I am not enjoying simply to learn what I don't like about the writing style so that I don't repeat it in my own work. Good point, Kay! I do learn from books that I don't like. I may not finish, but I still try to analyze what it was about the book that didn't keep my interest.